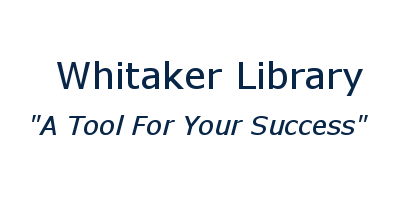 Whitaker Library actively serves the Chowan University community. During the last academic year, there were over 120,000 visits. Students, faculty, and staff use the library's collections, computers, and study spaces; while engaging with the library staff for friendly customer service. With a robust collection of over half a million books, academic journals, videos, and other academic resources both physical and digital, students will have the resources necessary to be academically successful. The Course Reserves collection offers materials selected by teaching faculty to aid in classroom success. In addition, students can utilize our online test preparation resources, resume builders and language learning programs. Whitaker Library is named after Dr. Bruce E. Whitaker (1921-2009), who served as the nineteenth President of Chowan College (now Chowan University) from 1957- 1989. Under Dr. Whitaker’s leadership, the campus flourished, and many new facilities were built including the current library building in 1968. 45 Years of Whitaker Library was written by South Moore, and publisned in CU Today the Fall/ Winter 2013 issue.